Home > Chiagu Blog > Eight years people. EIGHT! On this day 8 years ago, I started blogging about knitting. Almost nothing in my life is the same as it was then, when I was a senior in college and living in PA working minimum-wage jobs. 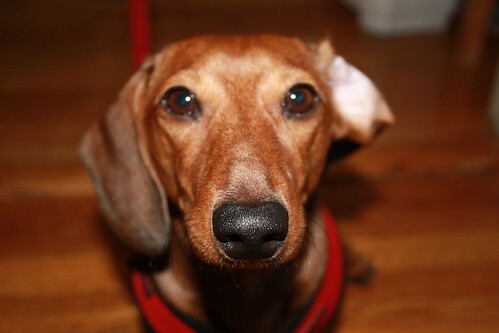 There have been a few constants: knitting, of course, and dachshunds. 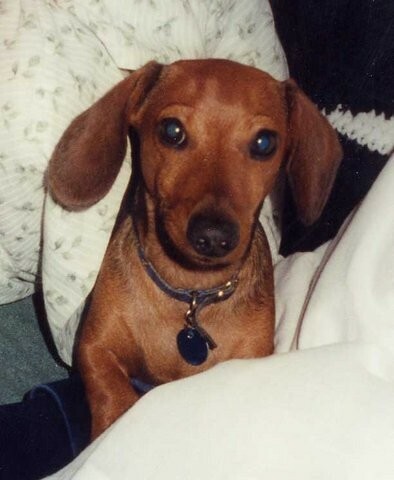 I had a dachshund, Pepper, then, and I have Arnold now! They look pretty similar, don't they!? They have the same coloring, but Arnold's much bigger than Pepper was. It used two strands of Woolease held double on a size 8 (I think) needle and a free pattern I found online. The heels are much too deep because I mis-read the "slip 1, k1" instructions and just slipped the first stitch, not every other stitch in the flap. They fit OK, but there is definitely tons of extra room in the back heel. These socks have survived to this day and I still wear them! Acrylic really just never breaks down, does it? These may actually end up outliving me . . .
Single-stranded Koigu on size 1's using my own design, which I've published and have available for sale from my own website. Funnily-enough, these use the same slipped-stitch heel as the socks above, only I do it correctly now after figuring out my mistake back in 2002 . . . I've come pretty far, huh? A big THANK YOU! to all of you out there who've been reading my knitting ramblings, whether you've been with me since the beginning or we're just getting to know each other. I'm more energized about my knitting and designing than I have been in years and I hope to bring you lots of new exciting designs in the next few months! Here's to another 8 years of knitblogging! Congratulations! I hope I have your longevity in both knitting AND blogging. Both your dogs are very handsome and you’ve sure come a long way since those socks! eight years!! that’s so awesome, congrats!!! Happy Blogiversary! 8 years, wow! Awww…Pepper looks so precious.